Experience a gleaming collection of dazzling baguette diamond eternity rings—featuring channel set and flush set diamonds in many exciting combinations. Choose your perfect arrangement of baguette cut diamonds, with our without alternative diamond shapes, and select from a wide assortment of widths from 2.5mm upwards. Enjoy a choice of many precious metals and the reassurance of expert help before and after your baguette eternity ring purchase. 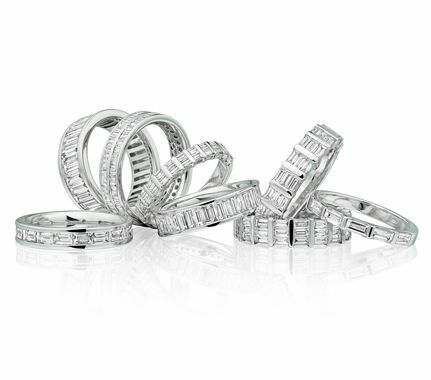 Baguette diamond eternity rings work exceedingly well with both channel and flush set eternity ring styles. Rectangular in shape, yet small enough to follow the circumference of a ring, each diamond lays side-by-side or alternatively end-to-end. In addition, the Serendipity Diamonds collection includes a further choice of mixed diamond cuts. We mix baguette and princess cut diamonds in alternating arrangements, along with baguette and rounds for another exciting combination. Each baguette eternity band receives incredible attention to detail with precision channels set with perfectly measured baguette diamonds. Completed with a mirrored polish, each diamond eternity ring arrives in a pristine presentation box, under bespoke packaging, sent directly from the team at Serendipity Diamonds, directly to your door, with Worldwide shipping to most countries.